Alice in Wonderland dress for girls. It has Alice in Wonderland themed decorations on the dress and includes a headpiece. Be well dressed to discover a wondrously strange world. 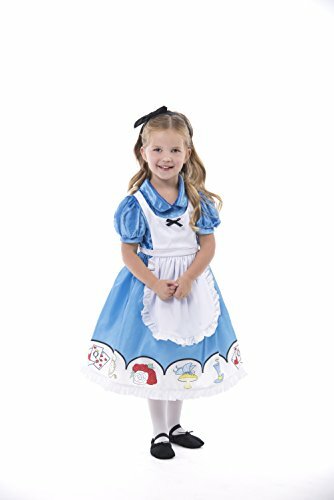 The deluxe Alice in Wonderland child costume is a dress with an attached apron and is decorated with lace trim and printed storybook graphics. A ruffled lace headband is also included. Shoes and socks not included.